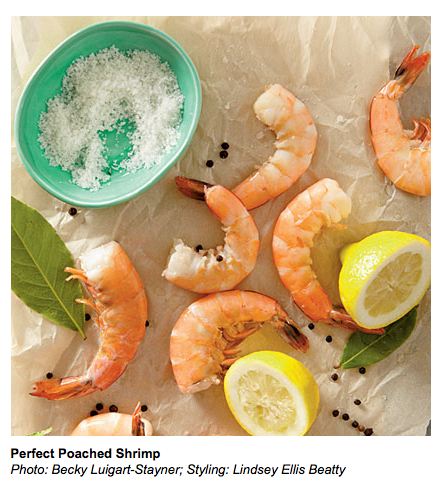 I struggle, as many of us do, with perfectly cooked shrimp. One minute too long and, well, it’s inedible really. Too short and its sushi (or bait) and not the good kind. I can cook some sauteed shrimp like nobody’s business, but sometimes have a hard time judging how to boil or poach them. I found this recipe in Southern Living’s online website and snagged it here for you. This week, they will be used in Shrimp Salad. The old fashioned kind we used to have as a child. I’ll post the recipe and photos later. Fill a large bowl halfway with ice and water. Pour 4 qt. water into a Dutch oven; squeeze juice from lemon into Dutch oven. Stir in lemon halves, black peppercorns, bay leaves, and salt; bring to a boil over medium-high heat. Remove from heat; add shrimp. Cover and let stand 5 minutes or just until shrimp turn pink. Stir shrimp into ice water; let stand 10 minutes. Peel and devein shrimp. Store in a tightly covered container until ready to use. Keeps 1-2 days refrigerated.